Business owners have more than their fair share of things to think about. Whether it be accounts, inventory, payroll or even the next staff birthday, they’re often inundated with tasks, and even the world’s best delegator can often have multiple plates spinning at once. We’re here today to eliminate a pretty big spinning plate. Selling a business, especially a business that was built from the ground up, is often one of the proudest moments in a business owners’ career. Such a special moment shouldn’t be filled with stress and uncertainty of what steps to take to ensure the best dollar value for the business. 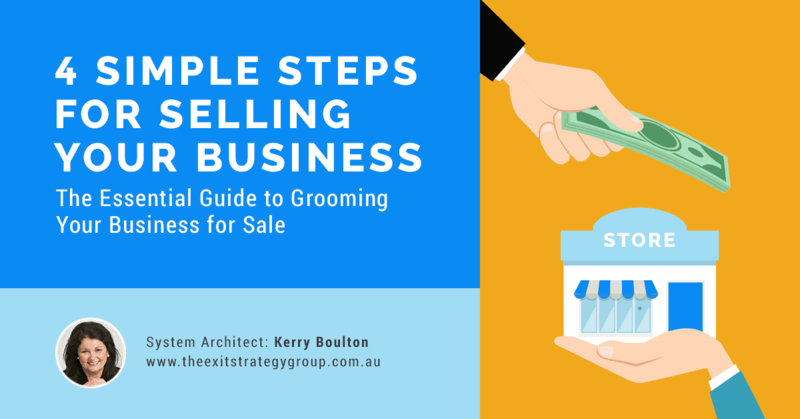 Kerry Boulton’s 4-Step process helps business owners groom their business for selling. Read along with Kerry as she walks us through her EXIT strategy: Evaluate, Explore, Innovate and Transition. Step 1: Run the business through several benchmarking tests. The first step of the process will expose the current standing and status of the business as well as the individuals running the business. Several benchmarking tests are undertaken. Step 2: The results are compared against the best practices. Numbers and figures will show up after doing the tests and they will be sufficient enough to arrive at an estimated financial valuation of the business. During this process, it is expected you will come across and discover some gaps within the business. Business Financial Performance – a good financial track record for at least the last three years can boost the business value; includes business assets. Growth Potential – is there room in the business to grow? Cash Flow – this will identify if the business is generating money or using more than it earns. The amount that the buyer will need to put in to keep working capital running will obviously mean a decrease in business value. Business Differentiation – simple value proposition. 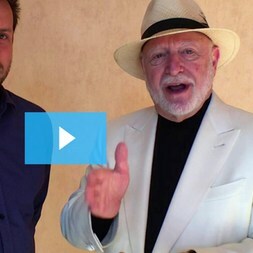 This is the unique aspect of a business that sets it apart from the competition. Recurring Revenue – Do you have any products or services that generate recurring billing, or do you have to make a sale every time there is money coming in? This factor creates an enormous value to the business. Step 1: Brainstorm and explore possible business acquirers. After acquiring sufficient information about the business from the first step, the second step involves brainstorming and exploring possible business Buyers in the market. The target is to come up with at least ten potential buyers who may come from a wide range of areas such as competitors, large public groups, and international buyers. Building a great relationship with these identified possible key acquirers should be done over a period of time. It is good to note as well that it is not always necessary that the whole business is sold. For some people, selling only a component of their business is a good option. Step 2: Explore the owner’s personal and financial goals. In addition to exploring for possible acquirers, this stage also includes exploring the owner’s personal and financial goals after selling the business. Step 1: Patch up the business gaps that were discovered. The third process revolves around patching up the business gaps that were discovered from the initial evaluation, keeping in mind the potential acquirers in the second step. After assessing the first two stages, feedback is provided to the business owner on where concentration of effort is most needed. The innovation process focuses on closing the gaps within the business and making it more appealing to possible acquirers. The result is often a highly noticeable improvement in terms of business value. Note! 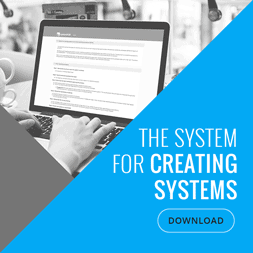 A major and key factor that will exponentially improve business value boost is systematising your business processes. 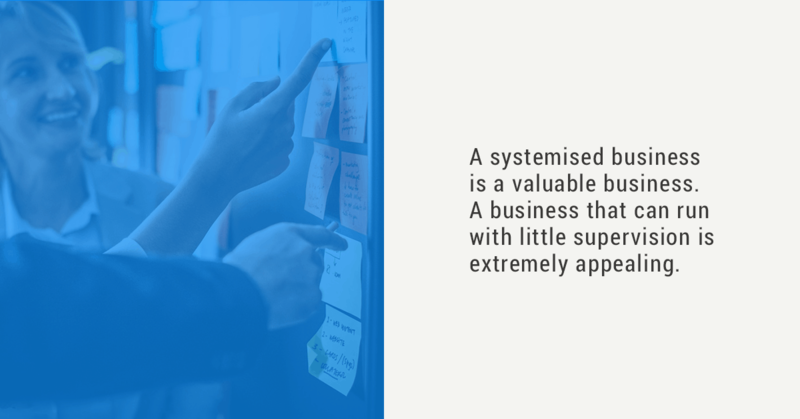 A business that can function without much supervision through systematised processes is often the most valuable business. Step 2: Perform a mock due diligence. Before the final step, a mock due diligence is performed. A sweep is done through the business and to drill down to make sure everything is ready, including creating an electronic “vault” to store all the business information. A due diligence list can have 300 items or more to fulfil. Each has its own effect on business value so it is essential to fulfil them all, if possible. Note! It is essential, a non-disclosure agreement be signed before disclosing any detailed business information to the buyer. A full due diligence is not usually performed until an offer and Heads of Agreement or Letter of Intent is executed by both parties. The final step covers the scope of negotiation as well as completion of due diligence by the acquirer. A formal valuation is entirely optional and can be done on a case-by-case basis. Terms of the deal are just as important as price and can be identified during this process. Whether it’s your first time selling a business or you have a few sales under your belt, ensuring you do you due diligence when preparing your business for sale can often be the difference between thousands (or hundreds of thousands, or millions!) of dollars in your pocket, as opposed to the buyers. Whether it’s your first time selling a business or you have a few sales under your belt, ensuring you do your due diligence when preparing your business for sale can often be the difference between thousands (or hundreds of thousands, or millions!) of dollars in your pocket, as opposed to the buyers. 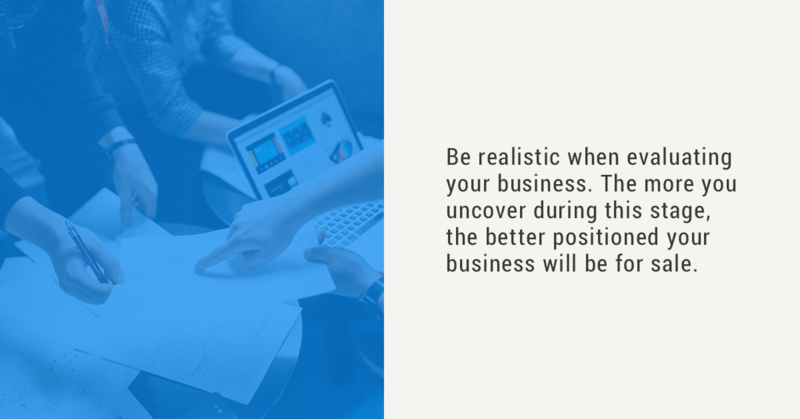 Once you’re across Kerry’s EXIT strategy, you’ll have confidence in knowing you’re getting true value for your business. To have Kerry walk you through her 4-step EXIT strategy in person, watch the video below! 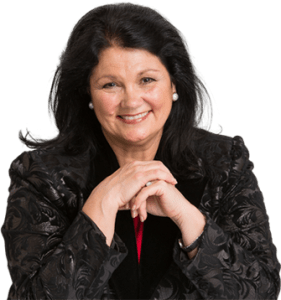 Following her purchase of Freight Management International in 1987, the business was successfully sold nine years later after a multimillion-dollar dollar turnaround – giving Kerry one of the biggest pay days of her career.